In 1957 Life Magazine created a sensation by publishing an article about the experiences of Gordon Wasson, a JP Morgan executive who took mind-altering mushrooms with a shaman in Mexico. The story captured the imagination of a generation, and Wasson is often credited with having triggered the psychedelic revolution. His influence lives on through the growing community of people who study indigenous spirituality, sacred plants and their role in personal transformation. 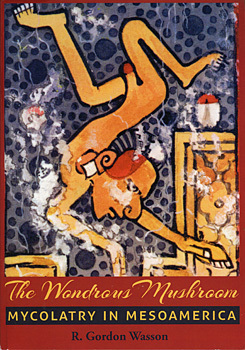 The Wondrous Mushroom is Wasson's in-depth study of shamanic realities, hallucinogenic mushrooms, and the traditions that connect contemporary practices to pre-Conquest art, architecture, and culture. The book begins with Wasson's first experiences, and goes on to provide a wealth of details about indigenous ceremonies, culture, and practices. Long out of print, this new edition is a must-have for anyone interested in the history of psychedelics. "From now on any comprehensive study of Ancient Mexican civilization must start from (and with) [Wasson's] discoveries." "The late Mr. Wasson is the Abraham of the reborn awareness in Western civilization of the presence of the shamanically empowering mushroom." "City Lights can be congratulated on their re-issue of Wasson's classic of cultural history and ethnomycology. Through his contact with Maria Sabina, the Mazatec mushroom curandera, Wasson brought about the cultural transfusion of an ancient entheogenic ritual into the modern world. In this beautiful and generously illustrated monograph, written with his customary scholarly acumen and literary elegance, Wasson established forever the central role of the visionary teonanácatl mushroom in the religion, art and culture of the Aztecs. A book filled with wondrous details about the meaning and significance of our relationship with these fabulous fungi."